In 1991, scientists aboard the submersible Alvin were in the right spot at the right time to witness something extraordinary. They had sailed into the aftermath of a very recent volcanic eruption on the seafloor and found themselves in a virtual blizzard. They were densely surrounded by flocs of white debris, composed of sulfur and microbes, which drifted more than 30 meters above the ocean bottom. The seafloor was coated with a 10-centimeter-thick layer of the same white material. This vast volume of microbes did not come from the ocean. The eruption had flushed it out from beneath the seafloor. The discovery was transforming. It strongly suggested that previously unimagined and potentially huge communities of microbial life were thriving in the dark, increasingly hot, oxygen-depleted rocky cracks and crannies below the ocean bottom. An abundance of life apparently flourished in conditions we had considered too extreme. It shattered our narrow preconceptions and stretched our view of the places and circumstances that can harbor life. With our horizons expanded, we have launched new initiatives in the past decade to search for life deep within the earth—to explore the so-called subsurface biosphere. In recent years, scientists have discovered many new subsurface biosphere habitats—reaffirming the principle of the pioneering microbiologist Martinus Willem Beijerinck (1851-1931), who said, “Everything is everywhere, the environment selects.” Beijerinck’s approach—to study “the relation between environmental conditions and the special forms of life corresponding to them” —certainly applies to the subsurface realm, where biology and microbiology interact with geology and hydrology. What organisms inhabit this deep biosphere? How deep are they living? How long can they survive under these conditions? How have they adapted to take advantage of energy supplied by the planet, rather than by the sun? What impact, in turn, does this biosphere have on the oceans and the planet? What can these hardy, entrepreneurial organisms teach us about the origin and evolution of life on Earth? How can they guide our search for possible life on other planetary bodies? We are at the frontiers of answering these questions. 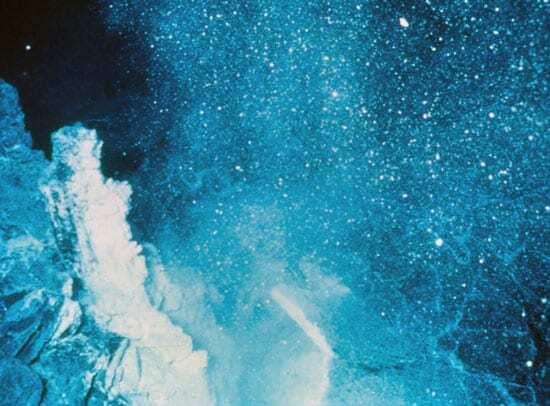 The amazing discovery of life at seafloor hydrothermal vents in 1977 reminded us that solar energy, oxygen, organic matter, and photosynthesis are not the only fundamental building blocks and chemical processes that foster life. In place of energy from the sun, certain organisms use chemosynthetic reactions to live and grow. They use inorganic chemicals, such as hydrogen and hydrogen sulfide, rather than organic matter for their energy and carbon dioxide as their source of carbon. Geothermal, rather than solar, energy catalyzes chemical reactions that generate these life-sustaining chemicals from rocks and seawater. Water is the only absolutely essential ingredient. But below the seafloor and deeper into the subsurface, it was reasonable to assume that conditions would become more extreme and life would become sparser or nonexistent. Yet in the past decade we have found an extraordinary diversity of subsurface microbes living in a wide range of conditions—buried deep within ocean sediments, in hot ocean crust crevices, in frozen polar soils, and in the subterranean bowels of deep mines. In all these places, individual species have adapted to extreme conditions that include high pressure, high and low temperatures, unusual or toxic chemicals and minerals, or low availability of essential nutrients. Often they take advantage of specific extreme conditions to carve out a niche where they can thrive and other species cannot. 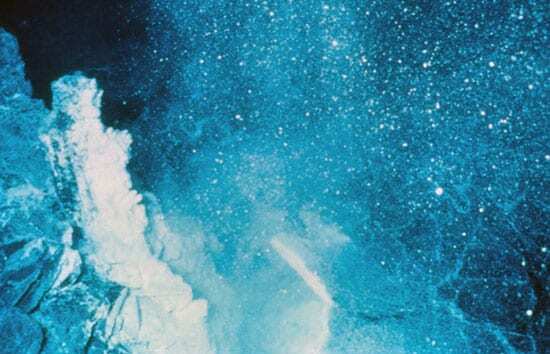 Take, for example, the mats of white microbial sulfur debris witnessed by scientists aboard Alvin in 1991. WHOI scientist Craig Taylor, Stefan Sievert, and I subsequently found that such mats are produced by a genus of bacteria called Arcobacter. It lives in low-oxygen conditions and metabolizes hydrogen sulfide (H2S) to obtain energy. An end-product of this metabolism is a unique form of sulfur, which the bacteria ingeniously excrete in the form of solid, white filaments. Together, large populations of these bacteria produce crosshatched mats of these filaments. In the face of flowing subsurface hydrothermal fluids, these mats help keep the bacteria anchored to rocky surfaces where Arcobacter are perfectly suited. They are bathed in hydrothermal fluids percolating from the ocean crust, which are low in oxygen and high in hydrogen sulfide. In this niche, Arcobacter feasts on ample H2S-rich fluids and outcompetes other oxygen-respiring bacteria. It turns out that these discharged bacterial mats may also provide an important carpeting around hydrothermal vents that attracts other animals, such as Alvinella tubeworms, and encourages them to settle and grow. And when we looked closer to home, we found Arcobacter bacteria in sediments in the shallow depths of Eel Pond in Woods Hole that grow and produce the same sulfur filaments as those at the deep-sea vents. Remarkable microbial adaptations like this seem to be common nearly everywhere we look. In 1999, far from any undersea volcanic areas, the world’s largest bacteria were identified by an international scientific team that included former WHOI microbiologist Andreas Teske, who is now at the University of North Carolina. They were found in the surface layers of ocean sediments off the coast of Namibia, where they find what they need: hydrogen sulfide for energy and nitrate to respire. This bacterium, Thiomargarita namibienus (“Sulfur pearl of Namibia”) reached sizes up to 750 microns (normal bacteria are only 1 to 2 microns). It was so large it could be seen with the naked eye, and it shattered our conventional wisdom that inherent bacterial physiology prevented them from ever getting so big. Their size is due to a large vacuole in their cells, in which they store nitrate, as do some hydrothermal vent microbes, to survive periods when oxygen is lacking—much the way we might store oxygen in external SCUBA tanks to remain alive underwater. Arcobacter and Thiomargarita are examples of well-adapted bacteria found in the shallow subsurface. But deeper subsurface explorations in the past decade have revealed unique, heretofore unknown microbial habitats. Some of the first investigations of the deep subsurface were motivated by concerns about pathogens and toxic chemicals in groundwater supplies. The Witwaterstrand Deep Microbiology Project, for example, a multinational effort led by Princeton geomicrobiologist T.C. Onstott, sampled groundwater in fractured rock from 3-kilometer-deep gold mines in South Africa and found a wealth of microbial diversity in the deep continental crust. In 2000, researchers from West Chester (Penn.) University claimed to have discovered the oldest known living microorganism in an ancient salt deposit in New Mexico, buried 610 meters (2,000 feet) below ground. It was trapped in a tiny brine-filled pocket that formed in a salt crystal 250 million years ago. Long after the dinosaurs became extinct 65 million years ago, it lay in a dormant state, waiting for the right conditions to “awaken” its genetic machinery and resume growing and reproducing, the researchers said. In the Arctic and Antarctic, scientists have found metabolically active microbes in subsurface permafrost frozen at temperatures of -10°C (14°F) or colder for 2 million to 3 million years. High populations of viable microbes have been found in oceanic sediment cores deeper than a half-kilometer, which would make them older than 10 million years. Ultimately, a combination of physical and chemical factors will set the limits at which life can exist. In general, increasing pressure will not limit the depth at which subsurface life is found. Increasing heat is the primary limiting factor, and it is doubtful that we have discovered the maximum temperature at which life can exist. At hydrothermal vents, volcanic heat has created an environment in which so-called hyperthermophilic (super-heat-loving) microbes thrive. The maximum growth temperature for a microorganism so far was discovered in 2003 by scientists at the University of Massachusetts. They called it Strain 121, because it grows at a 121°C (250°F). But scientists generally agree that life could exist at temperatures as high as 140° to 145°C (284° to 295°F). In the mid-1990s, scientists found novel hyperthermophilic microbes in hot oil reservoirs 3 kilometers below the North Sea and the North Slope of Alaska. Oil producers had thought that microorganisms, which “sour” or contaminate oil, were introduced into wells, but, in fact, they are naturally occurring and live on organic compounds in oil. Such discoveries push our understanding of the limits of life and the limits of where to look for it. The known largest biosphere—fully 80 percent of Earth’s available living space—is in the deep ocean, yet this may be eclipsed by the subsurface biosphere as research into this realm proceeds. Deep-sea drilling remains the best way to sample the subsurface, though it has limitations. It is costly, and potentially results in contamination of the samples retrieved. The deep biosphere has been targeted as a major research initiative of the new multinational Integrated Ocean Drilling Program, which operates deep-sea drill ships for the oceanographic community. A new permanent microbiology laboratory was outfitted aboard the JOIDES Resolution drill ship. Scientists have also developed new instrument packages that plug into and seal drilled seafloor holes, where they remain for months. These probes offer potential windows into the interacting chemical, hydrological, geological, and biological processes that occur beneath the seafloor. These long-term observatories have been dubbed “CORKs,” which is both an eponym and an acronym (Circulation Obviation Retrofit Kits). The real challenge is to develop sensors that can be placed in situ in a way that doesn’t disrupt the ecosystems they are meant to record and that are sensitive enough to provide continuous, even real-time, monitoring of processes occurring on even a molecular scale. Drilling cruises are scheduled to search for microbial life buried hundreds of meters deep under thick ocean sediments piled atop ocean crust in volcanically quiescent continental slope regions. In 2000, a consortium of Japanese scientists launched a several-year project using drill ships, manned submersibles, remotely operated vehicles, and long-term sensors, to explore, drill, and monitor the subsurface biosphere beneath hydrothermal vents near Suiyo Seamount, an active subsea volcano in the western Pacific. A major research goal of the Deep Ocean Exploration Institute at Woods Hole Oceanographic Institution is to extend our subsurface search into conditions on Earth that are deeper, hotter, and harsher than anything previously studied. We want to learn more about the biological and geochemical interactions that take place within this biosphere. Any residents we find in these frontiers may well be biochemical pioneers. In their genes, they will still have the original blueprints for a wide range of possible biological processes. Some of these processes—like Arcobacter’s sulfur filament machinery, or Thiomargarita’s large nitrate-storing vacuole, or the extreme heat tolerance of Strain 121—we may never have seen before. We may never know with complete certainty where and how life originated on Earth, but the hot subsurface around hydrothermal vents is a likely candidate. It is an environment that seems to have all the necessary ingredients to spark critical chemical reactions that could create the precursor building blocks of living organisms—ultimately resulting in amino acids for proteins, the genetic machinery DNA and RNA, sugars for energy, and lipids to make membranes. In a hot subsurface melting pot, far from solar ultraviolet radiation that can break down complex molecules, these chemicals could find sanctuary in tiny rocky crevices where they could congregate, interact, and perhaps combine eventually with a membrane around them. Below the sea, they would certainly be sheltered from meteor bombardment and other life-threatening conditions that buffeted the early Earth’s surface. Further insights into life’s ability to survive harsh conditions will guide our search for extraterrestrial life. New evidence from Mars shows that it once had water, and it may once have had seas that left salt deposits like those in New Mexico. Europa, Jupiter’s moon, is probably volcanic, and beneath its ice-covered surface may lie oceans with hydrothermal activity. The same tools and techniques we devise to search for life within and beneath Earth’s volcanic oceans will prove useful there. Our journey into Earth’s subsurface biosphere is a quest to find the limits of life. In 1991, scientists aboard the submersible Alvin witnessed the aftermath of a very recent volcanic seafloor eruption and found themselves in a virtual blizzard of white debris. World?s largest bacterium?In 1999 scientists discovered a previously unknown bacterium, which is large enough to be seen with the naked eye. Found off the coast of Namibia, the bacteria grow in long lines of single cells, each stuffed with reflective white globules of sulfur. The bacteria resembled a string of pearls to its discoverers, who named it Thiomargarita namibienus (?Sulfur pearl of Namibia?). The bacteria have evolved to live on seafloor sediments, where they find hydrogen sulfide for energy and nitrate for respiration. 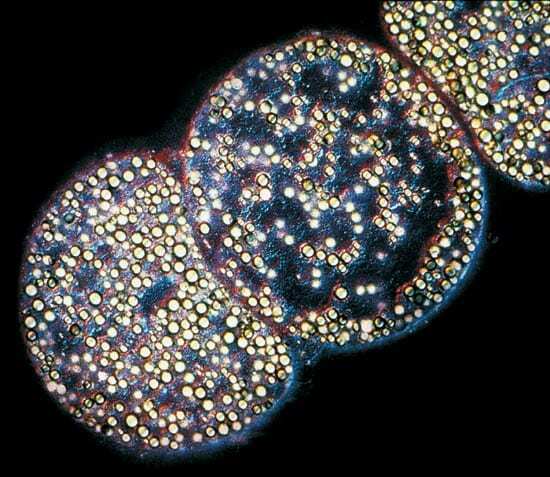 Their size is due to a large vacuole that fills the interior of their cells like inflated balloons. The vacuole stores nitrate, giving Thiomargarita the ability to survive periods when oxygen is lacking?a built-in equivalent of an oxygen-storing SCUBA tank that allows humans to remain alive underwater.